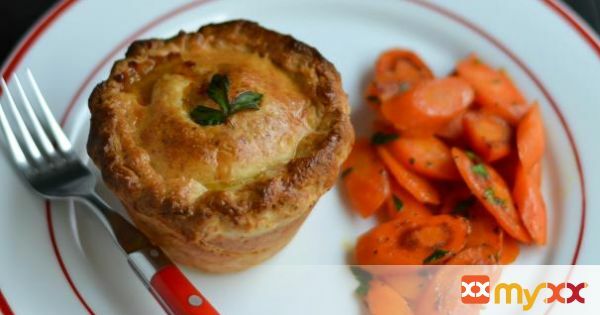 Tender and flavorful beef stew encased in a flaky Irish cheddar crust. Perfect for St. Paddy's day. 2. Place the cut up butter pieces in the freezer for 15 minutes to chill. 3. Meanwhile, in the work bowl of a food processor combine flour, sugar, dry mustard, salt and cayenne pepper. 5. After the butter has chilled, scatter the pieces over the flour mixture (still in the food processor), along with the cheddar. 6. Pulse about 10 times. 7. Sprinkle half the ice water over the dough, pulse about 3 times, repeat with remaining water, pulsing 3 more times. 8. Pinch the dough to check if it sticks together, if not add a tablespoon or two more ice water, until it comes together. 9. Dump the mix in a large bowl and press it together to form the dough. Divide dough in half, shaping each into a 4-inch disk. 10. Wrap each piece in plastic wrap and refrigerate at least an hour. 12. Pat the meat dry with paper towels and season with salt & pepper. 13. Heat 2 t. oil in a large skillet over medium high heat until just smoking. 15. Stir the meat and cook another couple minutes, until it looses the raw color. 16. Remove to a plate and set aside. 17. Reduce heat to medium, add the remaining 2 t. oil and the onions and carrots. 18. Saute until softened and starting to brown, stirring occasionally, around 5 minutes. 19. Add the garlic, thyme and marjoram, cook until very fragrant, about a minute. 20. Stir in flour, cook and stir about a minute. 21. Slowly add in the beef broth and water, then the meat, along with any juices left on the plate. 22. Bring to a simmer, then reduce the heat to low, to med-low. Cover and cook, (adjusting the heat as necessary to maintain a simmer) stirring occasionally until the meat is just becoming tender, around 45 minutes. 23. Remove from heat, add in the Dijon and parsley. 24. Adjust seasoning with salt & pepper and set aside to cool. 26. Remove the dough from the refrigerator 10 minutes before rolling it out. 28. Refrigerate the filled tins as well as the dough scraps 15 minutes to firm back up. 29. Meanwhile, preheat oven to 400 degrees. 30. After 15 minutes and the filling has cooled down quite a bit. 31. Divide the mixture evenly between crusts. 32. Divide the remaining dough into 6 balls. Roll out each piece wide enough to cover the pot pies. 33. Pinch the top and bottom crust edges together to seal, and finish the edges in whatever decorative way you like. 34. Brush the tops with the beaten egg. 35. Bake 35-40 minutes, rotating the pan after 20 minutes. 36. Remove from oven & let sit 5 minutes before (carefully) removing the pot pies from the tin.